User Review: "Buffer is the Bomb.com"
Our marketing department uses Buffer for social media management. Buffer helps us organize all of our accounts in one place. We are able to analyze, post, and schedule content from one seamless system to all of our social media accounts. Buffer is the ultimate social media management software. It has all the capabilities you need to successfully manage any number of accounts you may have. With easy to understand analytics and even easier scheduling capabilities, Buffer does not disappoint. It's an aesthetically pleasing one-stop shop software for all your social media needs. Review: "Buffer is a solid social management tool." The agency that manages our social accounts uses Buffer to manage the social calendar and scheduling of posts. We use it to review and approve content and will add posts to the calendar as well. This is being used by our marketing department and allows us to schedule posts months in advance. Provides great previews of what the posts will look like once posted. Easily allows you to see whats in the queue for each channel. Don't have any recommendations for improvement. It's comparable to most social management platforms. It's not over complicated and easy to use. It doesn't do anything particularly better than other platforms either. Review: "Buffer, the only social media scheduler you'll ever need"
Buffer has been an excellent tool for myself and other users in my organization. Buffer helps us better manage our various social media accounts across departments/ministries. We use Buffer to schedule social media posts to a variety of platforms and varying times. The main problem it helped us address the need for consistency in our online presence. Prior to Buffer, during a busy week, we often would forget to post to our social media due to time constraints. Buffer has helped us immensely in scheduling posts in advance and allowing it to post to a schedule that best suits the needs in our organization. Scheduling not as easy as other platforms. Unable to resize images within application when they are outside the constrained limits. Scheduling on your smartphone and online platform is a different experience for the user. One of the top applications when it comes to managing social media across platforms. It has been of great use for us to manage nearly 10 social media accounts in our organization. If you desire an online presence on Facebook - it allows you to schedule posts to both Facebook groups and Facebook pages. On Instagram, it allows you to schedule to various accounts. It also, has options for Twitter, Pinterest, LinkedIn, and Google+. 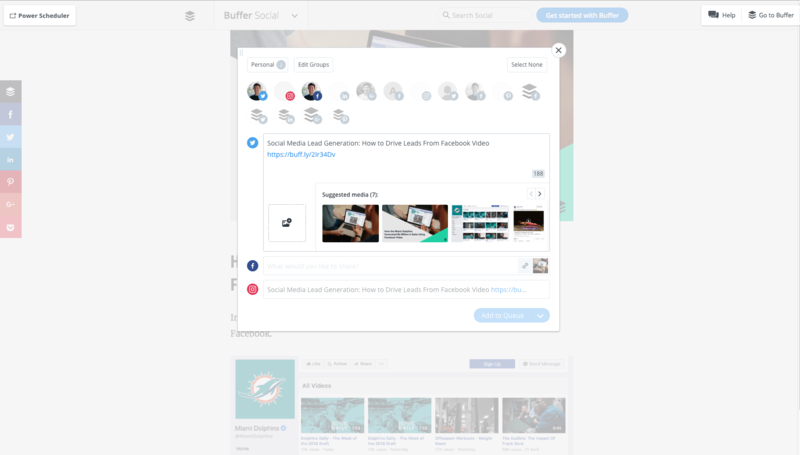 User Review: "Buffer makes content distribution easy"
Buffer is a simple tool that makes distributing your content to multiple channels effortless. I like the straightforward interface and simple layout. We are able to manage multiple clients' accounts with ease and consistency. Not only does Buffer allow you to post new content, it also allows you to queue content that you want to republish in the future. Scheduling of posts on multiple channels. Providing a monthly view of scheduled content. Although I like the streamlined look, the interface could use some colors to create better contrast. If you are looking for an app to distribute your content on multiple channels, or to manage accounts for your clients - Buffer helps save time and effort. Curated content is a great option for those who do not have their own content or need to supplement their content with related content from other sources. Buffer Review: "The Best Post Automator App yet!" I recently started a new sub-brand of my design company and use social media as a major means of getting my brand out there. Buffer helps me automate my posts on Instagram, Facebook, and Twitter. I am currently using the free version, but as my brand grows I will likely upgrade to the paid version if I continue to find Buffer of use. What I really love most about Buffer is that I can actually automate my posts to Instagram. Up til this point, while I could plan my posts, Instagram didn't allow automated posts from other apps I've used. So this feature is really incredible for me. I find Instagram to be my most profitable form of social media, so this is truly an essential function. You can use it on your desktop or mobile! I'd love if I could edit my images for Instagram before posting to the app via Buffer, but I imagine that's too much to ask! You can only connect three profiles if using the free version, but that's to be expected. Buffer is better than what I used previously (Hootsuite). I always found Hootsuite to be cumbersome and clunky. Buffer is straight to the point and I always prefer efficiency in the programs or apps that I use. I do wish that you could schedule more than 4 images in a gallery for instagram, but it's not a major issue since as a business account on Instagram, I prefer to space out my content anyways in order to reach the widest audience and create brand recognition through repeated imagery and style. Buffer: "Low investment, high return - saves time and supports an organized social media strategy"
I have recommended it in the past to clients who I've worked with on marketing strategies and implementations. I also used it for my own personal business when I was more active on social media for my marketing business, and if and when I join other platforms for my current business, I'll most likely do the same. It's an easy to use platform that helps schedule posts across multiple social networks easily. It's an easy platform to use AND the picaso aspect helps to create great images to add to posts. Big fan of that feature. Easy to schedule and edit posts. Analytics are easy to review. LOVE the feature that allows you to create images to attach to posts. Also easy to edit scheduled posts. I think Buffer is a great tool for a small business that wants to manage their social from one place vs. at the platform level. I also think that for an agency or freelancer who manages social for multiple clients, Buffer is where it's at. It's a much "fresher" platform than some of its competitors and the blog content that Buffer creates is super helpful. Review: "Buffer as a top-level social media posting platform"
The marketing department uses Buffer to manage social posting and their scheduling across multiple platforms. I would improve the analytics section, to have more data and suggestions for caption, content, posting time, etc. Buffer is perfect for small to medium-sized organizations, startups, and influencers to build a social posting queue, directly from their browser. Also very good if there are multiple managers. Review: "Buffer is the Social Media Management Platform for Us"
We use Buffer to manage our social media channels: Facebook, Twitter, Instagram. We plan out our content calendar of posts a month in advance, and we utilize Buffer to upload all that content and schedule various dates and time throughout the month to be posted. Our department posts content on all three channels and we have another department who posts content to two more Facebook and Twitter accounts. It allows us to collaborate on posts, review and approve content through various user permission levels. We can see all the posts scheduled on all our channels at a glance and see what days we have too much content or not enough. Working through Buffer allows managers/admin to oversee and approve everything that goes out on our social media channels so there are no surprises. It also allows us to review each channel's analytics to see how the content we are posting is performing. The interface is easy to use. You can pick up how to navigate everything very quickly. We connected to several social media channels and can schedule and post with relative ease. Their customer service has always been friendly and prompt with responses. They are honest and helpful. Buffer offers a review process so we can look over posts before they go live and ensure all content has one consistent voice that best represents us. It has been a huge lifesaver to manage all of our social media channels for various departments in one place. It's easy to use and oversee all the content going out on various social media channels. It makes it easy to manage all of your accounts in one place. In addition to posting content, you can view analytics for your various channels to see how posts are performing and when they perform the best. I wish the connection with Instagram was easier. You cannot schedules posts to go directly to the platform. You need to have the Buffer app in order to get a reminder on your phone to manually post at the designated time. I will say that Buffer makes it super easy to manually post from the app. They just copy the text, pull the image into IG and you paste the text and hit Share. We've also encountered some issues between the app and Instagram reminders. Usually, when we add a new user and they download the app in order to post to Instagram, they do not receive the post notifications. It takes a bit of back and forth and usually everyone has to delete the app in order for this one person to receive notifications. Then we all re-download the app. Another disadvantage to the app is that only certain access levels can post directly to Instagram. Some of our team members have the "Approval Required" access level. They can schedule posts for review, but cannot fully post. So if we want a team member with that access level to post to Instagram, they have to either log in through someone with "Full Posting Access" or we have to change their access level. Buffer Review: "As simple and straightforward as it gets for social media scheduling"
We use Buffer for social media scheduling and management within my unit, as part of a shared account across several units in the organization. After our Hootsuite Enterprise contract ran out, we were looking for a cost-effective solution that could help with basic management of about 20 social accounts total. We reviewed a few different tools, including Hootsuite, Sprout Social, and Tweetdeck, before deciding that Buffer was the simplest solution at the best price. Custom tracking. When sharing to multiple profiles, it's nice to be able to include different tracked links for each profile. By default, Buffer doesn't make this very easy - the standard campaign is just set to 'buffer', which can make traffic difficult to differentiate if you forget to create a unique link. Media editing. Images and videos are simple to upload and edit, but I do wish there was some more customization available to ensure that you select the right size for a given network. I've also run into cases where an image I thought I'd uploaded wasn't actually shared along with the post. Account management. We ran into an issue within our organization where we realized that not all our accounts were actually included within the Pro plan (vs. the free plan) because of it was required that our account administrator add the accounts. This may make sense in general, but was an issue for our organization with several distinct business units. Enabling more flexibility/permission levels for users would be nice. Account disconnection. Buffer seems to 'lose' its connection to LinkedIn often, which may be more of a problem with the LinkedIn API than with the software, but it's a pain to have to re-verify the page and in some cases re-schedule updates. I think Buffer is great for organizations that have a small amount of social accounts to manage, and where cross-unit collaboration is common. It's also good for organizations where the level of social media knowledge may not be very strong, as the tool is easy to use with minimal setup and training and it offers good basic tracking for evaluating impact. I think if you're going to be doing a lot of content volume across a lot of accounts and need robust analytics, there are more advanced tools out there to use. Buffer Review: "Simple to Use"
Our marketing department was using Buffer to publish to social media! It helps our department run more efficiently and saves a lot of time publishing and developing content across platforms. It also provides helpful insights into analytics and what content our followers like the best and what we need to cut back on posting. Multiple Platforms - Buffer was one of the first schedulers that allowed to post to Pinterest, which was extremely helpful. Nice for very basic scheduling with no social media analytics. Maybe good for personal accounts that just want to share their content and be able to control what time it's released. Or companies that have addition in-depth analytics software, this would work fine for them. People new to scheduling could also benefit from this simple interface. Review: "Buffer - great entry level social scheduling tool"
I initially came across Buffer when I was looking for a low-cost solution to implement for a charity I was consulting for. They needed something that was easy to use and that could be quickly implemented and easy to troubleshoot. Buffer fit the bill many times over! My first impressions were good - it offers a generous 'free' version which meant that I was able to get it set up and then train staff on how to use it, without making a financial commitment. We were very quickly able to attach social profiles and begin scheduling content which meant that the social media element of the job took a lot less time and became more productive. Simple straight-forward interface. The GUI is so much more straight-forward than competitors like Hootsuite and SproutSocial. Their interfaces can easily be overwhelming and take some getting used to whereas with Buffer you can be up and running very quickly. The 'free' element is very generous and enables you to become familiar with the software in as short or long a period as you need, across multiple social accounts. The integration with Feedly means that content curation is an incredibly simple job for anyone to perform, enabling you to schedule content as you come across it on the web. They used to have a fantastic feature that optimised posting times based on previous times' reach and engagement. Sadly this feature was removed which is a shame as it was one of my favourites. The reporting functionality is limited and I would like to see a greater ability to report across all platforms, creating white label reports. You have to purchase separate tools in order to access an influencer module and an image design module - in many tools these are included. Buffer is NOT trying to be all things to all men in the way that many tools are. I think the approach of 'keeping it simple' means that it is attractive to many as a starting point. I recommend it to businesses just starting out with social schedule especially those with 10 or fewer employees or with only a handful of profiles to manage. Once you start to want more functionality or have a greater number of profiles to manage I would recommend upgrading to something more powerful. "Buffer is a great tool for scheduling social media postings and organizing overall SMM strategy. Highly recommended!" For us, Buffer is a great tool to schedule our social media posts and then analyze how they perform. I personally use Buffer almost every day and I enjoy using it. The UI and overall experience is great and it does what it's supposed to do. We have connected several our social media accounts to it (e.g. Twitter, LinkedIn, Facebook) and each week I schedule posts for those accounts and then follow their performance using the analytics section of the tool. It helps us save a lot of time on social media accounts management and also have a better organized SMM strategy. Scheduling social media posts is great, it just works and you don't have to worry about it. Providing analytics for each post is very useful. Overall experience and UI of the tool is very intuitive and easy to use compared to some other competitors. 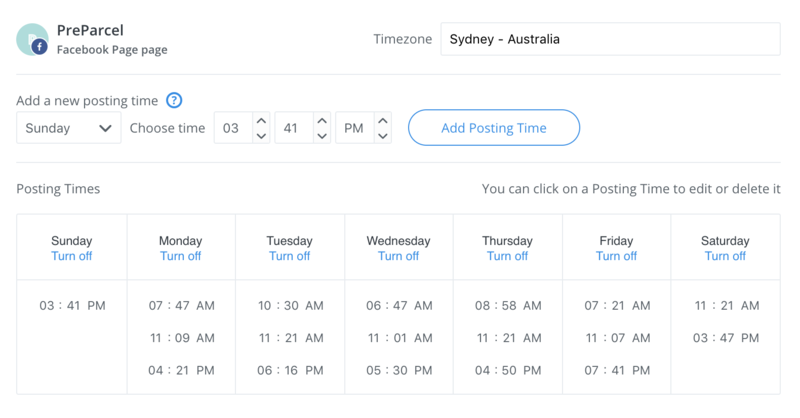 Being able to schedule social media posts based on time zone is a great feature. Would be great to see some of the paid plan features in the free plan as well, e.g. social media calendar feature. Sometimes LinkedIn account automatically disconnects from the Buffer account and the posts aren't published and you need to re-connect the account again. Happened to me a couple of times, but not a big deal actually. If you are looking for a tool to schedule your social media posts and then analyze their performance, then Buffer would be great for you. It's an easy to use tool that just does its job. It's suitable for anyone - startups, freelancers, small or medium companies, and even big corporations. Also, they have a separate tool called Pablo, which helps create beautiful images for social media postings. You can create a beautiful image with a quote on it in under 1 minute and then post it via Buffer. Buffer Review: "Great product for social media scheduling!" I used Buffer in my previous workplace where I was doing social media management. It was very convenient to use Buffer and it saved me a lot of time. Basically, I scheduled Facebook, Twitter, LinkedIn and Instagram posts via Buffer for several days and then was checking the analytics page to see how successful they were. Before using Buffer, the social media post scheduling process wasn't organized and the efficiency wasn't great. With Buffer the process became more organized and it was a pleasure to use it. Social media scheduling just works. Buffer does it perfectly. I usually connect several social media accounts to my Buffer account and it helps me a lot in organizing the posts for upcoming days or sometimes weeks. I used Buffer's mobile app a lot when I was out of the office. It's very helpful and keeps you on track so you can see which posts were posted and how they perform. Sometimes my accounts get disconnected and I don't know why. But it happens very rarely. Posting on Instagram was kind of hard, as it required to open the Buffer app, then open the Instagram app, copy-paste the content to Instagram and then post. As far as I know, it's because of Instagram's policy, not Buffer. Hopefully one day it will be solved. 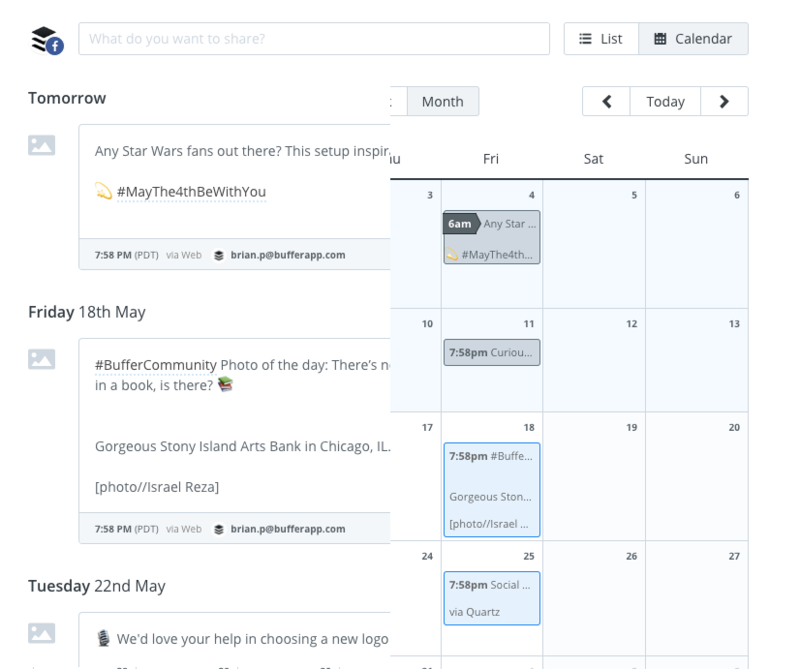 Buffer is an awesome product for social media management and scheduling. I used it a lot and it helped me save a lot of time. You can have the posts for upcoming days or weeks ready and quickly schedule them on Buffer and then sit back and enjoy. This is how I used it. User Review: "Buffer For a Small Business"
Buffer is being used by me for my client. I manage his social media accounts across Buffer, which has the ability to schedule social media posts into the future. The business problem it addresses is having the ability to plan your social media calendar in advance. The ability to view performance as well is a great feature. Buffer would be great for a small business. Due to low cost, it fits well into small social media management budgets. I can't see Buffer being a great solution for a large organization with many different social media channels. Buffer Review: "Easy to use, easy to save time." We used Buffer to schedule retweets of our content, a functionality that the other tools we were using did not support. We also used their Pablo tool for creating images for Facebook, Twitter, and Instagram, and receive their weekly blog emails. Buffer's ability to schedule social shares ahead of time was HUGE for our organization - it allowed us to break up our content without having to manually login and re-tweet things real-time. Buffer has a really clean interface. I wish Buffer would expand the creative constraints on Pablo. Right now there aren't that many fonts or creative liberties we can take, so it makes it difficult to stay on brand. Buffer is great as an additional tool for your social strategy, it's cheap and very intuitive. It cannot, however, stand on its own as the only tool your organization uses. Review: "Social Media Marketing made easy - GET BUFFER!" Buffer is being used by our organization to maximize the visibility of the various brands that we represent across the spectrum of social media platforms. We are a small business and Buffer is used by both of the two principal partners. 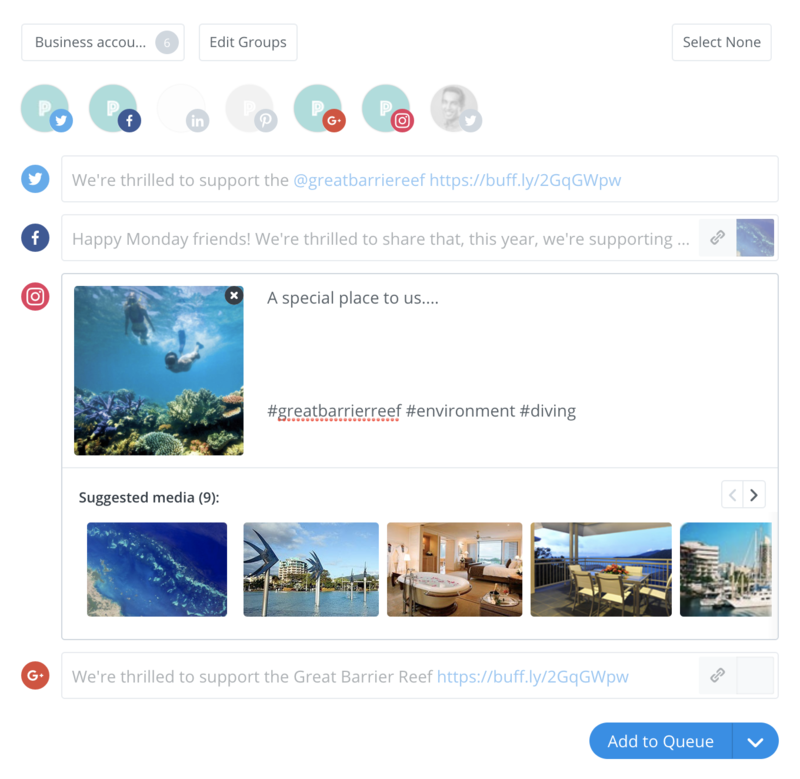 Buffer boosts our productivity by automating several steps in the social media marketing process. It used to take ten minutes or more to share content across two or three social accounts. We'd have to go in to each social platform and use its unique features to push the content. Now, with Buffer, we can easily and efficiently share that same content on up to twelve social accounts in just a matter of minutes. What a godsend! User Interface for sharing: Buffer makes it super simple to share content. (1) Cut and past the text + hyperlink that you want to share, (2) Select the accounts you want to share it to, (3) Add an image if necessary (Twitter)., (4) Select time frame for sharing. Buffer automatically shortens the link and displays a draft for your review. Super simple. Better overall interface and experience than both Hootsuite and TweetDeck. Direct Access to RSS Feeds: One of the nicest features of this app is that they've found a way to give you direct access to RSS feeds of content -- right in the app itself! Obviously we find the majority of our content as we browse the Internet in the course of our workday but this is a great way to save time when you're focusing on filling up Buffer with great content. You simply type a keyword in and it displays a variety of RSS Feed results for you to choose from -- for each social media account! More than I could ever use. Pablo Image Tool: Image preparation is one of the most challenging and time consuming areas of social media marketing. Buffer has found a way to simplify and integrate that process as well with 'Pablo'. Pablo is an integrated tool that allows you identify or upload relevant images and then customize them. Once they're ready for action you can either download them or share then right from the interface. It's intuitive and the most efficient web-based social media tool I've ever seen for images. Bravo! Google Chrome Extension: This is another feature that we used all day long. In the course of the day I'll run across excellent content and I can easily drop it into my Buffer account without having to stop what I'm doing in that browser by using the Chrome extension. Another great tool that I don't know what I would do without. Scheduling: Buffer gives us at least three ways to schedule our posts: (A) Manually (by date & time), (B) Automated Scheduling - I set up a schedule in advance and then can just mindlessly submit posts into my Buffer account and know that it will shoot them out in the order and frequency that I set up in the schedule, (C) Optimal Scheduling - Buffer now includes a tool that when activated automatically optimizes the times that you're posts will be published. I LOVE THIS! I want the most visibility and re-sharing of our content. With Optimal Scheduling I don't even have to worry about that and this frees me up to just focus on finding compelling content. WOOHOO! Customer Service: Buffer's customer service department is RADICAL! They're known as 'The Happiness Team' and they really mean it. They will not stop serving you until you are completely satisfied and happy. Buffer is not the easiest app to wrap your mind around and the integration aspects when you add team members can be hairy, nut they're always there for you and unlike most CSRs they'll be the first to admit when they have a feature that needs improvement or isn't working right. I had an issue pop up this weekend and a representative named Darcy took the time to provide support by screencast, direct message chats on Twitter and even a Google Hangout where we were face to face. I can't remember another time where I felt like a support representative understood my pain and bent over backwards to make things right. Well done Darcy! FAQs - Buffer is kind of like riding a bike. Once you get the hang of it - it's easy, But until you've got the training wheels off it can be a pretty wobbly experience. The FAQ's are written in simple, straightforward language but no matter how tech-savvy and experienced you are with apps it can be a bit frustrating and overwhelming to get it set up and to troubleshoot. In my opinion, it needs to be more visual. More screenshots, videos, and perhaps even interactive, real-time workshops or introductory classes for new users. Two-step processes - Unfortunately, no matter how hard I tried, I could find no truly 100% efficient way to share images and hyperlinks simultaneously. If you want to share an image across all platforms you can do that but then your FB / LI / G+ posts are identified as images ("Kevin shared an image") when in fact I was sharing an article with an image attached. Likewise if I share an article to FB / LI / G+ and the hyperlink is appended in the post then an image isn't attached to the Twitter post. Unfortunately, Twitter is inherently different from other social platforms so you just can't 'have your cake and eat it too!'. This is especially problematic when you're working in the mobile interface. After struggling with this shortfall for a year I've come to accept that I have to share in two steps if I want to optimize my posts for the various platforms. I do this by setting my defaults to FB page, LI and G+ profiles and after I share a post to those three platforms (which automatically append the hyperlink with image), I come right back and share to Twitter (which allows me to select and attach a relevant image as opposed to appending a hyperlink). I'm sure everyone's different but that's how we optimize our posts on the two different types of platforms. I recommend it for all businesses that are using social media marketing in their marketing channel mix. I can't imagine a single scenario where I wouldn't recommend it. My first recommendation would be to use it on a trial basis by registering for the individual plan. Once you've established that it will work for your business then upgrade to one of the paid plans based on the size of your business. User Review: "Bufferapp - a simple option"
I use it to schedule social media postings across various platforms, customising them for each one. You can post from scratch in the app, or use a Chrome extension to re-post third party content from any website (including the social media platforms) with your own comments added. Schedule by time and by day. Reports on engagement with the content. Occasionally posts fail - though you do get a notification. You have to be careful that you don't simply add a post without double checking which platform is selected - the app keeps the last platform you used and nothing is as amateur as using hashtags for your LinkedIn post! I'd like to see a trended analysis of engagement by post time. Buffer is simple to use, fairly flexible, and reasonably reliable. Review: "Take Twitter to the next level with Buffer!" I manage a team of students that post on social media. They have analyzed the best times to post and how to carefully curate content. Buffer makes it so easy to post when you want by scheduling the times you want specific content posted. We mainly use Buffer with Twitter, but it works with Facebook, LinkedIn, Google+, and Pinterest (paid-version only). Our click and like rates have improved since we began using Buffer. I receive a weekly email with the breakdown of how each tweet performed. Allows you to right-click and choose to post with Buffer. Puts the image in there for you too! Sends a weekly feedback report. Allows easy scheduling of posts. You can set up a predetermined posting schedule which is great when you know the times you plan to post. I wish Instagram was a connected social network. They used to provide suggestions of what to tweet if you did not have anything in the queue. It was great and I'd love for them to bring it back! I think Buffer works great for a social media account(s) where you post on a regular basis, several times a day. However, Buffer is so easy to use, I would recommend it for a personal account as well. There is now an incorporated image creator (Pablo) so you can create or an improve upon an existing image. No excuses for posts without images! We use Buffer not just for our personal accounts to schedule updates and blog posts but we also encourage and train clients on the use of Buffer to schedule their companies news, blog posts, events, or even company pictures. Working for an extremely busy agency or company doesn't allow for regular updates across different channels and pages. Buffer solves the problem by not only allowing us to post across multiple channels but also schedule it for the times WE want content to go live to maximize exposure. Additionally, the feature of adding suggested content is brilliant as it helps break up the monotony of simply posting *business* updates. And frankly, there are some great posts in the suggestion queue that I post because I want to read it later. Finally, it's free. My personal account has been a tremendous help in connecting with different people due to the content and times it is posted and if I want to use it as a team, well then we use the very affordable AWESOME upgrade. It's a tool that allows cross promotion on multiple levels, time zones, content and is easy to navigate. What more could an agency, a client and a team want. Scheduling: In social media it is critical to post regular updates but not become that annoying person or business that posts the days or even weeks updates back to back and appears spammy. Buffer allows users to pre-set times and dates in advance or on the spot for posts that are being placed in the feeder. For example: I have a new company blog I want to share. I open buffer queue and enter my status update. Then I can chose where I want to post it (FB, Twitter, G+ page, LI) and next I can pick a time and date. I can also change it up and schedule the Twitter update for noon today, the FB update for 4pm tomorrow and the LI update for Monday at 9am based on my audience behavior. In the remaining time I can schedule generic posts to appear engaged. Reporting: The weekly and monthly report is awesome. It is very detailed, easy to understand. The free version has a report as well but it is not as detailed as obviously the paid version. Price: You cannot beat the price from a company or honestly even a personal standpoint. It is extremely affordable for the service you receive in addition to their amazing customer service. Customer Service: They are by far some of the best in the world when it comes to customer service and appreciation. Even if you use their free app they still answer your questions or concerns with lightning speed and such a friendliness that you can't possibly leave upset. Their mission is to provide the best and more and they achieved it. It is suited for anyone in social media and quite frankly any business that wants their departments, teams and employees to participate and collaborate about social posts. There is a neat feature that allows team leads to approve posts before they go live. That is a life saver. The biggest questions to ask are - Does it cover everything we need and does it make our day to day lives easier? Are we okay with pre-scheduling and monitoring as we go? How much do we want to spend? Do we need to pay for everyone? To us, Buffer has provided us with extra value and time. It was a no-brainer. Buffer Review: ""Buff Up" Your Social Media Scheduling and Monitoring"
We use Buffer across multiple departments. It allows us to EASILY schedule, monitor and measure our social media efforts in one place. We needed something that was both intuitive and cost-effective (they offer a very generous non-profit discount), and Buffer is working nicely for us. UPDATE: Still use and LOVE Buffer. But have re-subscribed to Sprout Social (just myself, not the entire team) for their Social Media "Inbox." Just can't live without it. Total cost is just $109 per month (Nonprofit rate for Buffer Team, plus one Sprout account for myself.) Bottom line: Get both! AWESOME mobile app for iPhone and Android! Customer service that's too good to be true, but is. Ability to queue posts across multiple platforms at different times. Wish I could respond to Facebook comments via the mobile app. Wish canceling a queued message on one platform would cancel them all (versus having to go back and delete them individually). Wish the system suggested ideal posting times. If you need a unified social media inbox, and you have the budget to pay for it, then Sprout Social may be a better choice. Buffer Review: "Great for Scheduling and Managing Social Media Posts"
We use Buffer to schedule and manage posts across multiple social media platforms, and it's great for that; it also offers suggested content for posts. The product copy has a lighthearted feel for a solid business tool, which is in the spirit of the technology and makes the product more engaging to use. 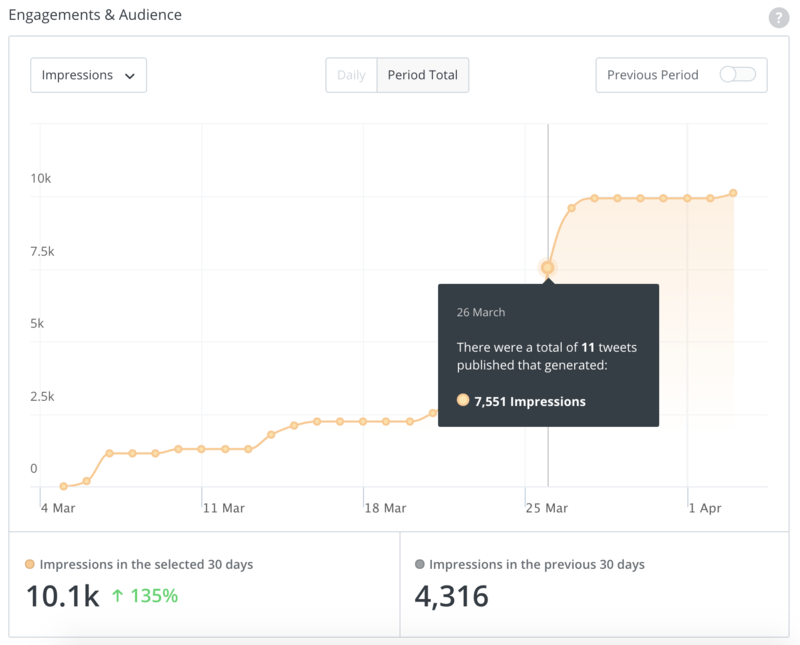 It offers very basic analytics on a post and platform basis, but it's not really designed for heavy-duty analytics - rather, it's a great addition to a suite of social media management tools. It's also highly intuitive and has a simple learning curve. I would recommend it to others. It's terrific for scheduling and managing upcoming posts, as well as for managing the posting schedule across multiple platforms. It has team collaboration features that are also useful for multiple person teams. User Review: "Buffer Adds Hours to My Day"
I use Buffer for myself, and for some of our clients. It solves the business problem of managing and posting content on multiple social media sites and profiles - you can do that all from Buffer. Integration is excellent. You can link all your social media accounts in Buffer, and can use the Chrome extension from any webpage. Flexibility in scheduling content, so you can schedule posts throughout the day. Analytics, Buffer gives you instant data on RTs, mentions, and post engagements so you can determine what's working and what's not. With all that data and analytics, Buffer should offer you the best times to post based on past audience behaviour. It needs more integrations with tools like Nimble, you need it to work everywhere. Buffer should also recommend people on social media that you should engage with based on your content topics and subjects. Buffer is inexpensive, saves you a lot of time, and gives you enough data and insight to improve social media efforts. User Review: "Buffer = Social Media Success"
I use Buffer for myself, the company as well as other companies. We are using it to schedule Tweets at the beginning of the day. It saves us a lot of time because all we need is about 15 minutes in the morning for scheduling and we don't have to touch it again until the next day. It all depends on your budget and what you are trying to do with the app. Buffer Review: "Smart. Simple. Streamlined." I use Buffer to automate our social media posts for the company. While it's owned/controlled by the marketing team, it is used for the corporate social accounts. It is a great tool for scheduling out a mixture of our own content and helpful things I find online that our customers would find interesting. It helps you be a good content marketer. Scheduling out new content from our blog and company announcements across multiple social channels has never been easier. The browser plug-in makes it super easy to add content from other sources into the buffer queue to share later. As the company has grown, they've added new features, the best of which has been the content suggestion. They'll suggest content for you to share and they make it easy to schedule. Figuring out their content recommendation engine is critical for them. It's a newer feature so there's plenty of room to grow. It's well-suited if you are taking the help, not sell approach to your marketing. It's a great way to always keep your social accounts active with interesting content. I use buffer app in my Android cell phone for almost two years and I'm satisfied with it. Buffer has been a good tool to keep me active on social networks, publishing interesting news I read on a daily basis. Application crashes easily in any security change in the registered social networks. Eventually, it's important to review the text to be published by the Buffer app. 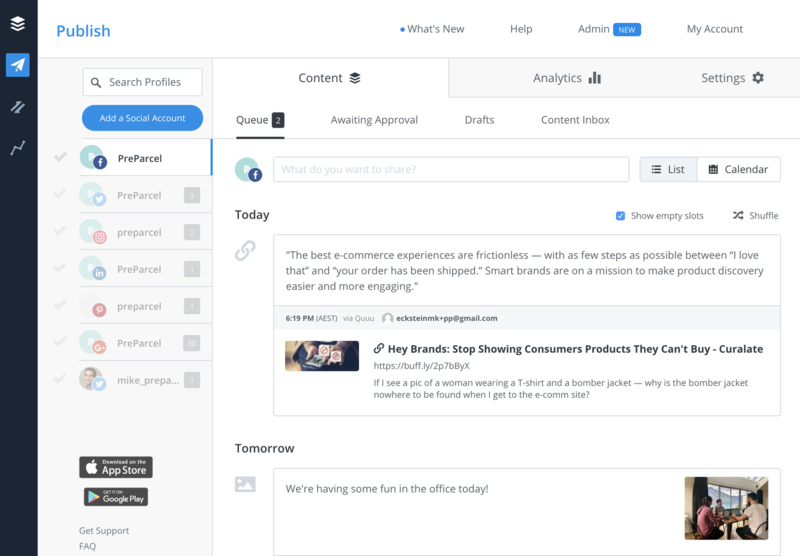 According to the vendor, Buffer is an intuitive streamlined social media management platform trusted by brands, businesses, agencies, and individuals to help drive meaningful engagement and results on social media. The company has a suite of products for publishing, engagement, analytics, and team collaboration. Products are carefully considered and highly refined in order to help social media marketers and teams work more efficiently and effectively.